basis in ponds 2 and 3 whereas pond 1 served as a control. During the culture and after each pond treatment, water samples were analyzed for pH, salinity, CO3 and HCO3 alkalinity, Ca+Mg hardness, total N and phosphate. There was not much difference between the ponds with respect to water parameters. The discharge water from the ponds during the culture was taken to the ETP and then used for raising Salicornia crop in the adjacent plot. 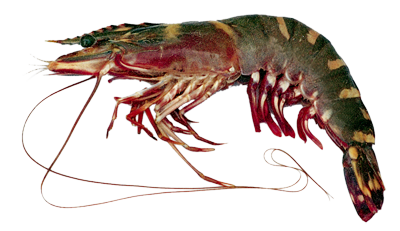 Harvesting of shrimps was done after 122 days of culture and the results of production and survival . Though the survival rate was poor in all the ponds due to high salinity at the time of stocking, the survival rate was comparatively higher in CIBASTIM treated ponds. The overall survival rate was 47.1%. The production and quantity of grade A shrimp was also higher in ponds 2 and 3, compared to control by 9% and 19%, respectively. Though quantity of grade B was less in treated ponds than control, the overall production was higher by 6.6% and 11.5% in ponds 2 and 3, respectively compared to control. The total production obtained was 551kg and the productivity was 1147.9 kg/ha/4 months. A revenue of Rs.1,78,956 was realized from this culture. The results indicated that with biosecured aquaculture and by using CIBASTIM, production of healthy shrimp can be achieved with the possibility of using the discharge water to raise Salicornia crop as an additional source of income.